Create Embellish Adore: It WAS beginning to look alittle like Spring! It WAS beginning to look alittle like Spring! almost winter like weather. Cold, blustery cold and winter jacket all over again! Anyways.... Can you tell I am in need of some new supplies.. but there is something to be said about out with the old, in with the new. 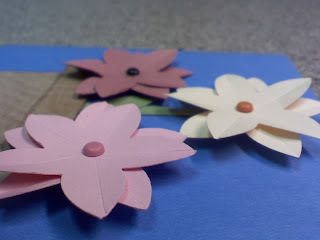 I decided that I was making flowers with whatever scraps I had left. These flowers were put into a bag for later use... not that I didn't want to use them right away.. but the 5 petal punch was only on loan... I really need to get one of these punches. 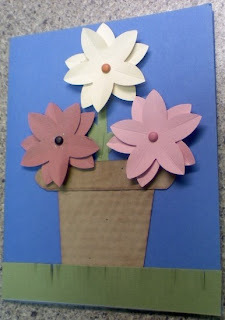 However, I got this itch to make another pot of flowers! So I did!!! I gave the flowers some 3D with scoring the inside of each petal. I connected the flowers with a brad, so they still moved... I inked the flower pot with Close to Cocoa and ran it thru the crimper 3 different ways, then took my score tool and pressed out the crimping. I like the textured look it gave. Of course I put the pot on some grass, completing the look. Love those flowers. Very pretty.